WHY GO AND MISS THINGS? The map measures 19.5 inches (49cm) by 28 inches (71cm). 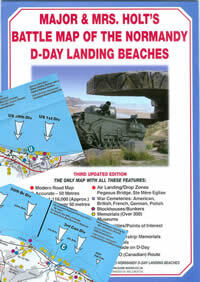 It is printed in four colours and is on firm glossy paper. On one side at a scale of 1:116,000 are shown The British Landing Beaches from Bayeux in the west to Ouistreham (covering GOLD,JUNO and SWORD) plus the 6th BR AB DZs from Pegasus Bridge to Dives. 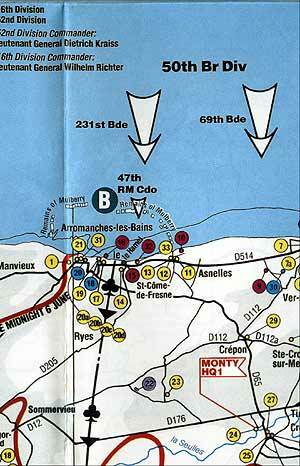 On the other side at a scale of 1:116,000 are shown the US AE DZs around Ste Mere Eglise and Ste Marie du Mont and the US Landing Beaches, UTAH and OMAHA. There is also a small boxed section showing the area of Falaise and the locations of the major memorials that mark the actions at the Falaise Gap. On both sides is a base map showing modern roads, thus making navigation simple. 1. Location. Thus upon seeing a marker at reference H32 on the British side, the index explains that it is the site of the memorial to the Queen’s Own Rifles of Canada. 2. Thematic. If wishing to find the memorial stained glass window to the US 82nd AB at Ste Mère Eglise, the index explains that it is at grid reference R13 on the US side.